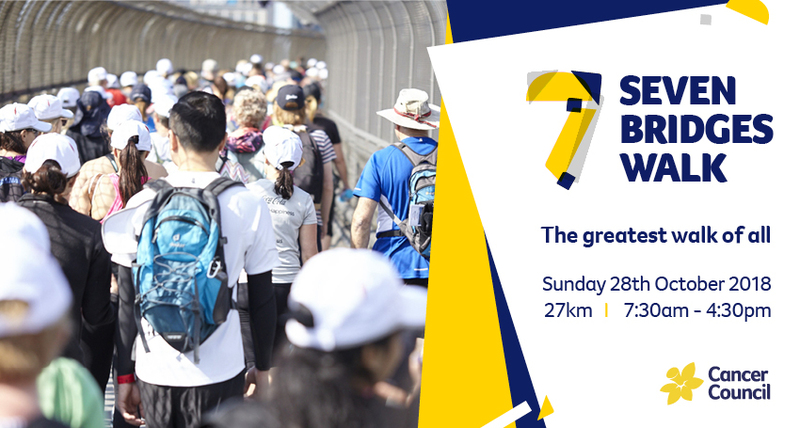 Cancer Council NSW 7 Bridges Walk is an annual fundraiser where the community unites to walk 27km around Sydney Harbour. The event was first run in 2006 and to date over 100,000 people have taken part and raised over $4.1m for Cancer Council NSW. This year, the walk will take place on Sunday 28 October 2018 from 7.30am til 4.30pm, with a fundraising goal of $969,000. It’s a great day out with friends and family with plenty of food and entertainment at the event villages to keep you energised along the way. Every step counts because all funds you raise will help Cancer Council NSW work towards our vision of a cancer free future. CHILDREN 16 YEARS AND UNDER ARE FREE. Please select the accompanying adult ticket when purchasing as a family. The child ticket will be allocated the same start time as the adult ticket. © 2019 Ticketbooth on behalf of Cancer Council NSW 7 Bridges Walk. All sales are final. Tickets are non-refundable.